Guests at the Napa River Inn can visit the Riverfront for a world-class dining experience, with diverse cuisines to satisfy every craving. Check out the hotel’s special packages when booking a room; some include a $100 dining credit to such establishments as Morimoto Napa, Angèle Restaurant & Bar, and Celadon. 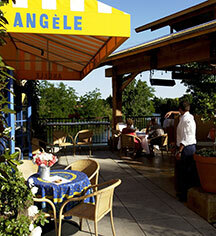 Angèle Restaurant & Bar is an intimate French bistro perched above the Napa River. The 155-seat restaurant is the realization of the Rouas family’s dream to create a refuge that offers delicious French country foods, wines, and a space for celebrating with friends and family. With all-day service within the 80-seat rustic yet elegant dining room and on the 75-seat riverfront terrace, the celebration is ongoing. The Rouas family has designed an oasis where a European sensibility of food and wine captures the true essence of joie de vivre. Celadon is an award-winning restaurant which provides world-class service in a lovely dining room and a charming courtyard. 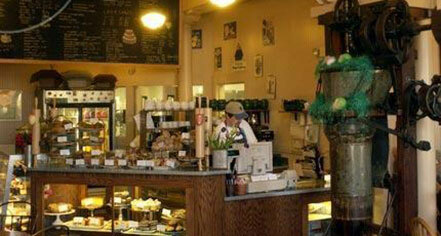 The seasonally influenced menu features flavors from the Mediterranean, Asia, and the Americas. The industrial chic venue with Antique French advertising posters offer a variety of unique and tasteful dishes. Morimoto Napa’s contemporary Japanese menu infuses traditional dishes with Western ingredients and preparation techniques. The seasonal and ever-changing selection of raw fish preparations features the freshest seafood available, as well as locally grown fruits and vegetables from supporting farmers.